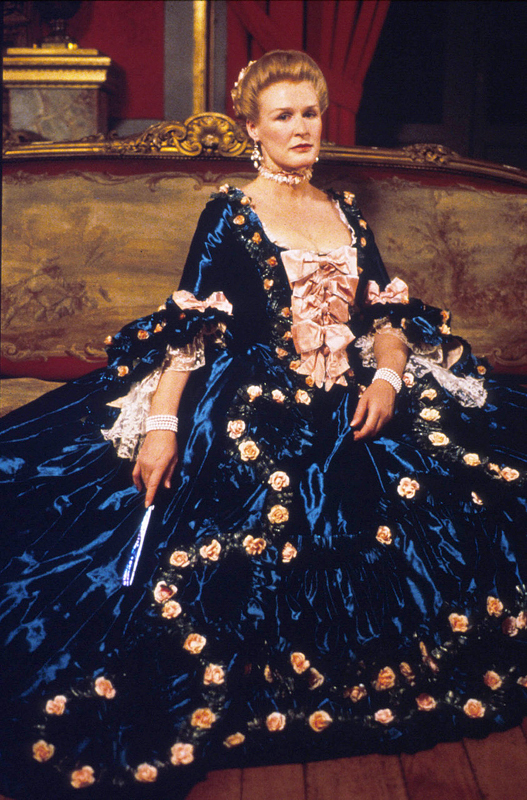 To accompany our podcast for the 1988 film Dangerous Liaisons, we’d like to share some of our favorite costumes from the movie. It’s hard to choose because, whoa, this film is perfect, even all these years later. You can see larger versions of most of these by clicking the image, and where relevant, we’ve linked to historical citations. But mostly, we just want to enjoy the eye candy! 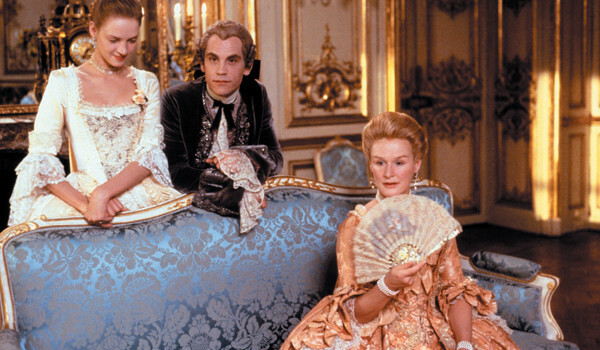 The opening scenes of Dangerous Liaisons that show the Marquise de Merteuil and the Vicomte de Valmont being dressed are both historically accurate and incredibly fun, setting up these characters as rich, pampered, and bored. LOVE the powdering cone Valmont wears during the dressing scene. Let us also admire the details of his wig. Everyone needs a fabulous silk damask robe volante for lounging around the château. The gown her servants dressed her in — and so reminiscent of this 1767 portrait of the Marquise de Caumont La Force by François-Hubert Drouais. We believe this is the same costume on display. Sorry the colors look a bit off, either it’s the display lighting or the photo. The embroidery is amazing on both of them here — his waistcoat and her jacket. The dress worn by Madame de Volanges (left) is awfully fuschia on screen, but the stomacher trim in pleated fans, and the petticoat trim in pleated triangles, are both FABULOUS. The fussy chemisettes that Tourvel wears do have historical precedent and not just for old ladies — compare with neckwear in this portrait of Princess Sophie of France circa 1770 by Lié Louis Périn-Salbreux. Fantastic trim is par for the course in this movie. We would like to point out, again, that this film was made on a tiny $14 million budget — and that’s for the ENTIRE FILM, not just the costumes! So, don’t ever let anyone tell you that you can’t have amazing costumes on a small budget. 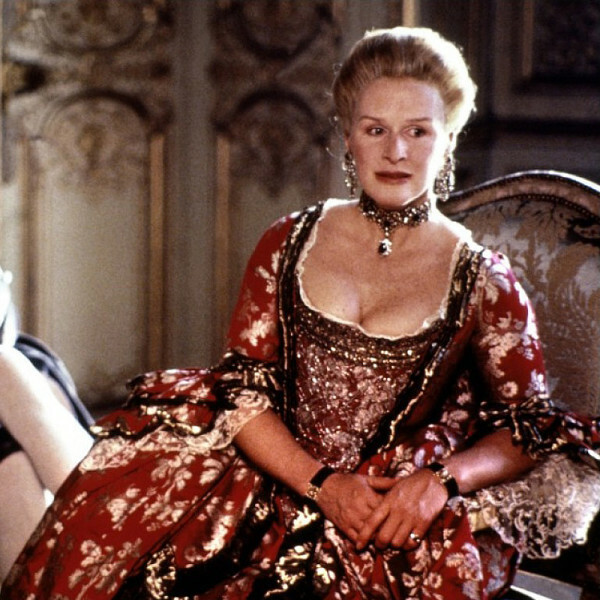 Cécile de Volanges wears an appropriate Scalamandré strawberry-print gown (this fabric will later be used in 2006’s Marie Antoinette). This red dress is everything. 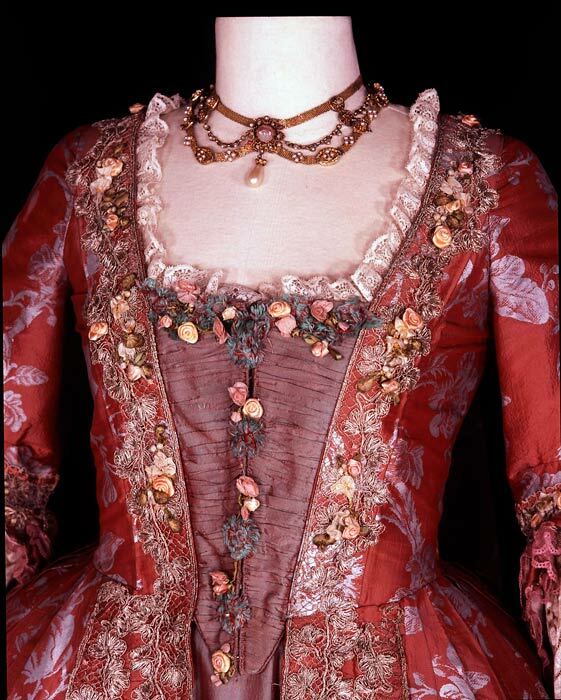 Another fabulous red printed taffeta gown, this one worn by Swoozie Kurtz as Madame de Volanges. 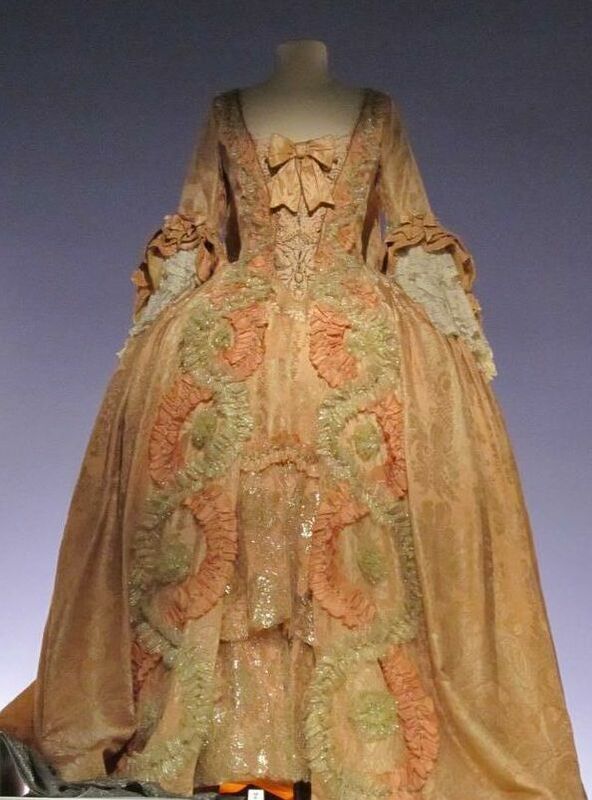 A close-up of the same gown. Tourvel is often wearing compère (button) front gowns, which add to her fussy, prim character, and the style suits the period. Zoom in on this 1775 French gown at the Met for similar buttons (they could be functional or not). 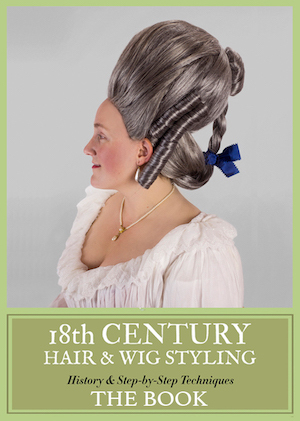 The Vicomte de Valmont is super-suave in pink with a curled wig. The Marquise wears an homage to François Boucher’s 1756 portrait of Madame de Pompadour. This white dress on Michelle Pfieffer is also reminiscent of another painting by François Boucher, this one from c. 1750. This white francaise is the one later worn by Madonna for “Vogue” at the 1990 Video Music Awards. Madame de Tourvel is wearing a brunswick jacket that’s almost identical to this 1767 portrait of Lady Mary Fox by Pompeo Batoni. 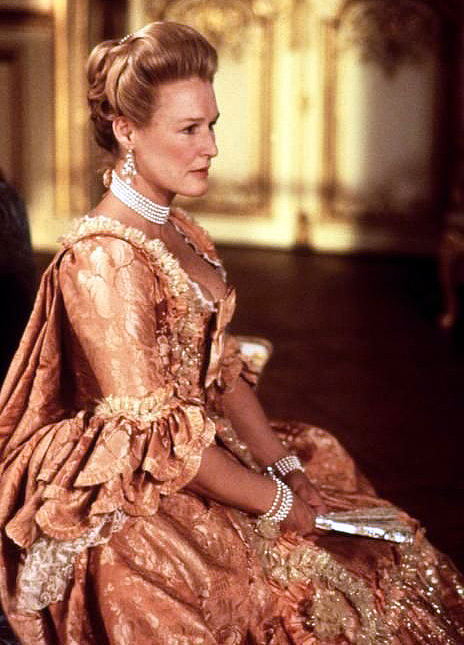 The final gown the Marquise de Merteuil wears is a court style — maybe not exactly right for the opera, but it’s still exquisite. 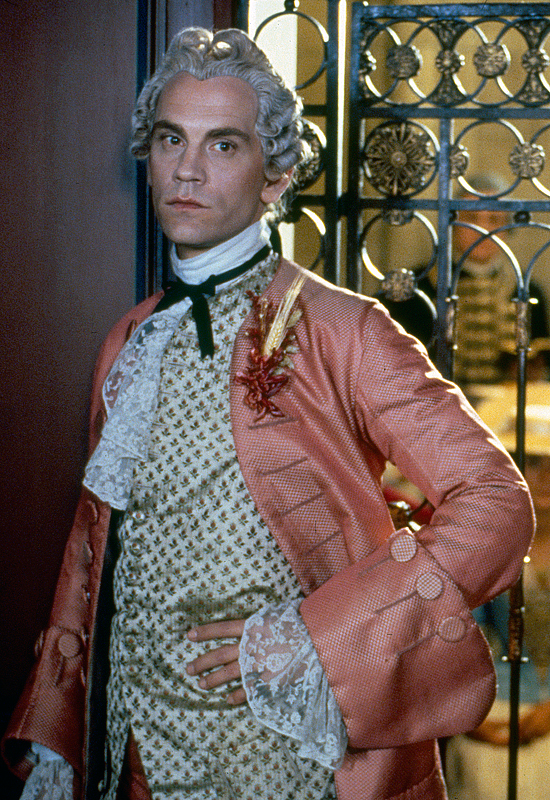 What’s your favorite costume in Dangerous Liaisons? Can you pick just one? My favourite women’s costumes for this are the ones Glenn Close Edwards’s the marquise followed closely by the viscount and Michelle’s. 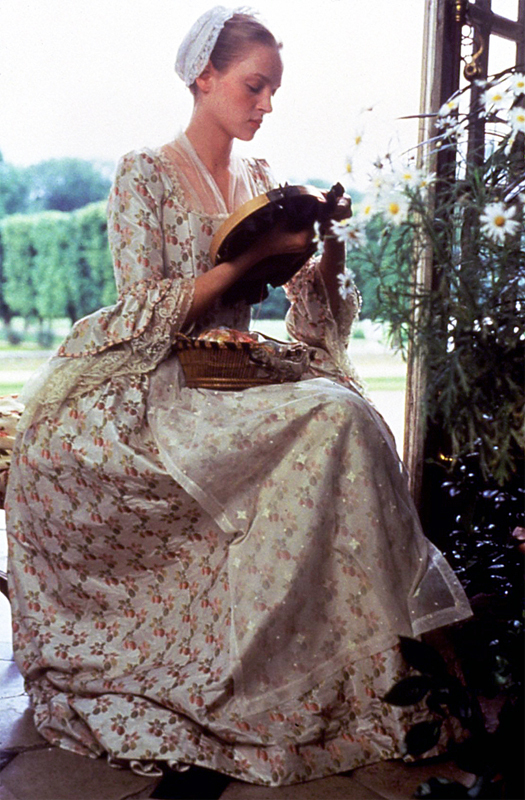 Uma’s Cecile’s are appropriately virginal and her mother’s are nice, but she’s not a fashion setter like the Marquise. But I really love them all. I abhor detest autocorrect. Edwards in last post should be wears as. Argh. I zoomed way in and I spy at least one button hole, so it would appear as though those buttons on the original gown are indeed functional. OMG that blue on the Pompadour dress! This movie is just so, so much more impressive in all regards than “Valmont.” I have to wonder how MUCH of the 14 mil budget went to costumes, because they are FABULOUS. From the tiny amount I was able to glean in the research I did for the podcast, it wasn’t much. The impression I got was that they were way more concerned with the location (all shot on location in France, which ain’t cheap) and the talent (although none of the stars at this point were exceptionally huge–they all got majorly famous after DL was released). Glenn Close was top billed, and it was post-Fatal Attraction (which had come out the previous year), but I don’t think she was considered a major box office draw at that point. Most of the contemporary reviews seemed to be repeating variations on “What an interesting and unexpectedly great film!” so it doesn’t seem like people were expecting the caliber of the movie they got and were pleasantly surprised. The Blue dress is just so eye catching! Though I *might* be making a copy of the yellow riding outfit for next years Salty Ball. The budget issue only reinforces my contention that it is just as easy to do it right as to do it wrong. They put every penny on the screen and clearly researched it to a fare-thee-well before they did it. DL is my favorite costume movie of all time. Learning from you guys that it’s ridiculously accurate, AND was done on a tiny budget just makes it better. Being an embroidery wonk, my favorite costumes are Valmont’s embroidered waistcoats. (If that’s the correct term.) Those make me want to branch into 18th century embroidery one day. But the truth is I couldn’t pick just one of the costumes from DL as a favorite. I adore so many of them it’s impossible to choose. I read this thread two years later, but thanks somuch for posting it! 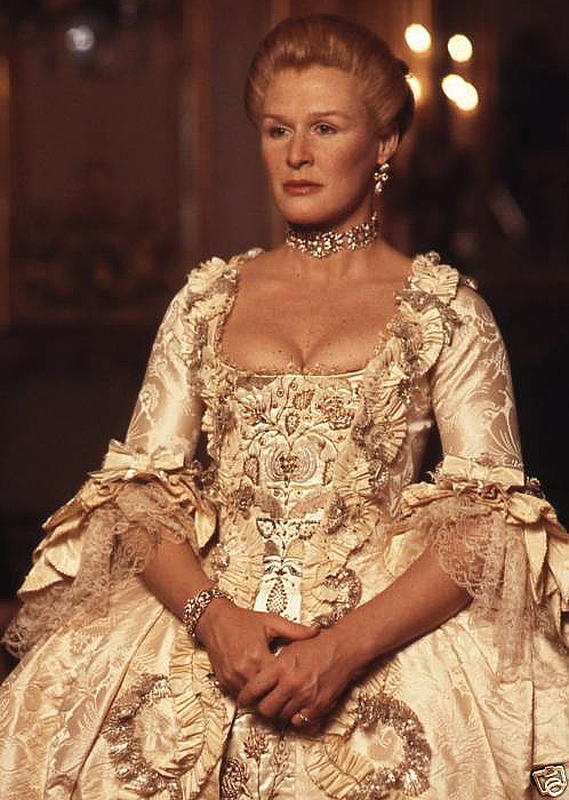 Just a little note of correction, the gown in the second to last photo was worn by Madame de Volanges (Swoosie Kurtz), Cecile’s Mother, not Glenn Close.